In the 9/11 community, Davidsson is no blank sheet. He has published books on 9/11 and the follow-up terrorist attacks that set the world on fire. „Hijacking America’s Mind on 9/11″, followed by „Psychological Warfare and Social Denial: The Legend of 9/11 and the Fiction of Terrorism“ (Psychologische Kriegsführung und Gesellschaftliche Leugnung: Die Legende des 9/11 und die Fiktion der Terrorbedrohung) presented a different narrative. An English translation of a condensed version would be very informative and highly useful for the English speaking public. The elucidation of a terrorist offense suffers from the fact that governments clean up only as much as it benefits them politically. Such an approach also holds true for the Mumbai attacks. The impression given by the Indian government that all facts were on the table, is, according to Davidsson, false. 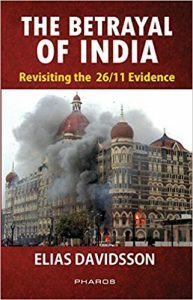 As with the „9/11 Commission Report“, which pretends to present the real events and the backgrounds, the same holds true for the processing of this heinous crime of 26/11, 2008. In both cases, statements of witnesses, which didn’t support the official narrative were glossed over or brushed aside. „The book is about the betrayal of the Indian nation by a corrupt, greedy and ruthless elite for whom the lives of ordinary Indians are expendable when power and profit are at stake,“ writes the author. From day one, a particular part of the official account was questioned, namely, the circumstances surrounding the deaths of three senior police officials and their assistants. Many Indians voiced their suspicion that the authorities were covering-up facts and called for an independent and impartial investigation of the events. Dieser Beitrag wurde unter Islam abgelegt am August 15, 2017 von Ludwig Watzal.